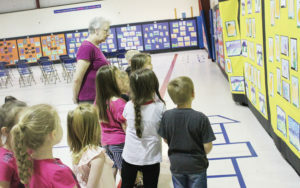 Each of the students at Elkhart Elementary School and Elkhart Intermediate School had their best artwork featured in the annual art show held Tuesday, March 13 in the Elkhart Elementary School Gymnasium. Photo by Sarah Naron / Messenger. 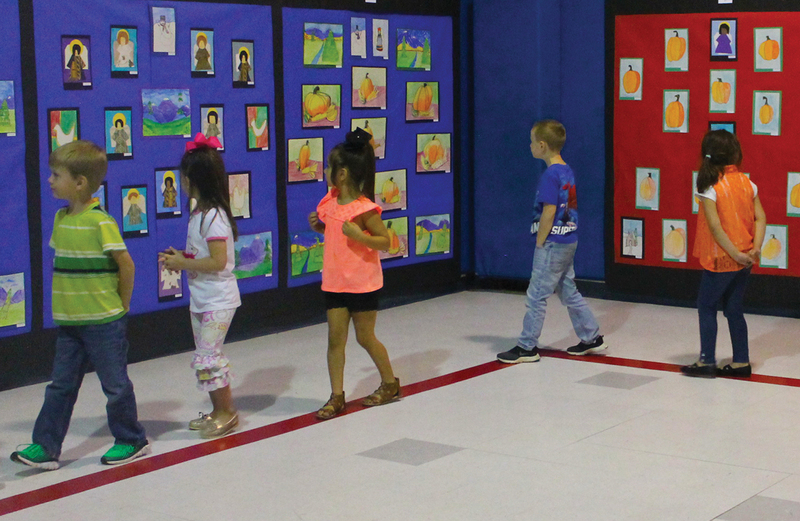 ELKHART – The students of Elkhart Elementary School and Elkhart Intermediate School presented their best work during the school’s annual art show held Tuesday, March 20 from 5-7 p.m. in the Elkhart Elementary School Gymnasium. Among the projects presented in Tuesday’s show were pieces mimicking the work of British environmentalist, photographer and sculptor Andy Goldsworthy. Photo by Sarah Naron / Messenger. Also featured in the show were large, painted rocks which will go on to be used as markers in the garden currently being grown by the third, fourth and fifth-grade students. Acrylic paintings on canvas by fifth-grade students were also displayed in the gym, as well as miniature snowmen created from Model Magic by Pre-K students. Weavings constructed from paper were presented by students in third and fourth grades, while yarn weavings done by fifth grade students were also displayed. Rainey has been teaching art for the past 17 years and instructs students in Pre-K through fifth grades. She estimated that she has approximately 575 students altogether. Rainey explained that she instructs her students through guided drawing to create representations of photographs, posters and real-life objects. “The next thing that I think is most important is to get as many different types of art media in their hands as possible,” Rainey continued. Rainey spoke of plans to help the fifth-grade students in her classes step out of the comfort zone of guided drawing. Rainey also provided information on a fundraiser held by the art students near each Christmas.